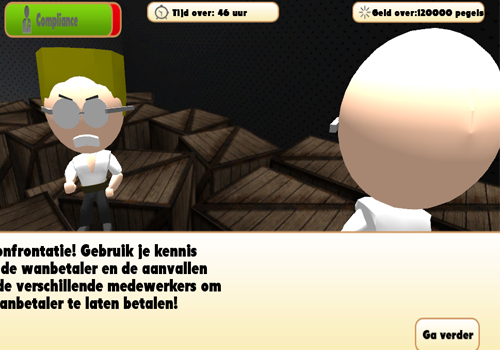 This project, for the Dutch tax authorities, consisted of making a game to help train their employees. It was to teach the reasons why people do not pay their taxes (ignorance or reluctance), how to recognize these reasons as well as how to handle them to collect the tax money. In addition to all of this, the players have to learn how they spend both money and time working on these cases and need to earn more money with their work than they spend doing the work. As a core concept for our game we chose to use resource management. The most important goal for the tax authorities is to collect as much money as they can, with the resources they’ve got. The two main resources in the game: Time and Money. The player starts with a certain amount of time and a certain amount of money. Any money earned does not add to the cash they can use in game, it can instead be viewed as points. The game ends when the player runs out of either time or money. The game consists of an overworld, shaped like a small piece of a city with some houses as well as a few businesses. These businesses are all owned by people who do not pay their taxes like they should. 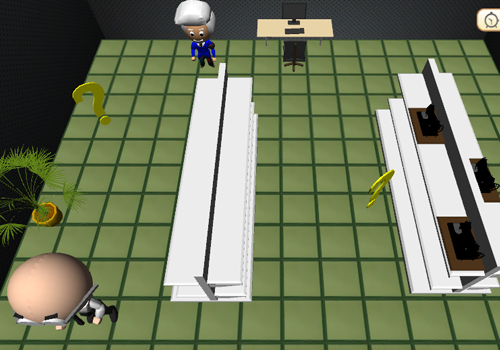 The player would enter one of these businesses where they will have to confront the owner and collect his tax money. Before actually confronting the owner, the player walks through the building. Every step the player makes costs a certain amount of time, as well as money. In terms of resources, the cheapest way would be to go directly to the owner for a confrontation. In this confrontation, the player would have to take certain actions against the owner in order to get him to pay the taxes. This happens in a fashion that is quite similar to the combat in the Pokémon games on the Gameboy platform. The player “attacks” its opponent, after which the action will prove to either be effective or not. In our tax enforcement game, these attacks would all cost money as well as time to perform. The effectiveness will depend on whether the opponent is ignorant or reluctant. Actions informing the opponent will be effective against the ignorant, but not against the reluctant. Actions involving lawsuits, police intervention or fines will be effective against the reluctant, but not against the ignorant since they simply do not understand what they need to do. Not knowing whether your opponent is ignorant or reluctant will cost you a lot more money and time because it would take more attacks to defeat him. In the company’s building the player can also walk around the compound instead of going straight towards the owner. In the building the player can find clues implying whether the opponent is ignorant or reluctant. The player can decide to invest more time and money in walking around the building before the confrontation to do some research on their opponent before confronting him, resulting in an easier confrontation, thus costing the player less cash and time. Just like in the real world, the important thing in this game is to find a good balance between investing in research and confronting the opponent as quickly as possible. A good understanding of the ignorance vs reluctance principle will get you the highest scores. Since the average age of the employees at the tax authorities is between 40 and 50, we decided to make the enemies in the game familiar characters from tv series that aired in their youth including the A-team’s BA Baracus owning a gym, Knight rider’s Michael Knight selling cars and Are You Being Served’s Mr. Humphries who owns a sewing workshop. Since most of our target audience are not very experienced gamers, we made the places they need to visit really stand out in the rest of the world to quickly grab their attention. As a team, everybody worked on developing the concept of this game, making sure everything our client wanted to communicate and teach with this game would be included in a way for the players to enjoy. 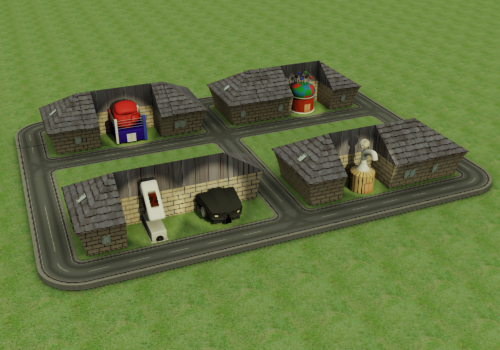 Besides working on the concept, I’ve been responsible of creating the overworld, the small piece of city with the themed buildings the player will start in, that connects all the buildings they can visit.